He is risen! He is risen indeed! Join us at Immanuel Lutheran Church in Joplin, Missouri as we celebrate the resurrection of our Lord Jesus Christ on Easter Sunday! The morning begins with the Sunrise Service at 6:30am. From the darkness of the tomb comes great joy. 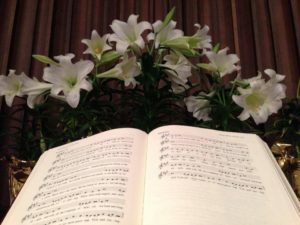 Be one of the first to greet our Risen King with beautiful scripture readings and hymns, a special Sunrise Service sermon by Pastor Mech, as well as the festive backdrop of easter lilies adorning the altar. Festival Worship Services with Holy Communion are held at 8 or 10:30 am, complete with choirs, special music and more. Come early to snap a family photo in the front yard, or to greet our Comfort Dog, Louie! Between services, the Youth and Elders are serving a delicious Resurrection Day Breakfast in the School Gym. Your free-will donation will help send our Senior Youth to the National LCMS Youth Gathering this Summer in Minneapolis. Don’t forget the Easter Egg Hunt for children, beginning at 9:45 am too! Limited menu is available beginning at 7:30am.